Our veterinarians and nurses are committed to caring. As pet owners ourselves, we understand and respect the special bond you share with your pet, as well as the love, loyalty and pleasure they bring to your life. Helen is the energetic and enthusiastic owner of the Vetkind group of practices. Before purchasing the Arana Hills practice, Helen worked in other private practices throughout Australia and for the University of Queensland. Helen also has a long-time commitment to volunteering in India and other countries with Vets Beyond Borders. Helen was awarded the David Bayvel Memorial Award for Excellence in Animal Welfare in 2016 in recognition of her work in improving animal welfare in India and other countries. 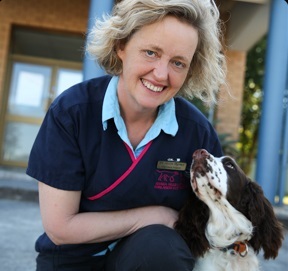 Helen is pictured above with her adorable but mischievious English Springer Spaniel named Woodrow who you may meet at our Arana Hills Clinic. 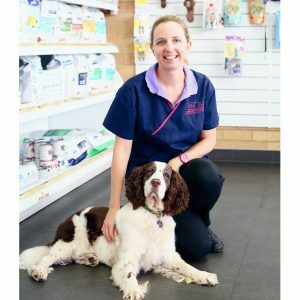 Anita has been working with the Vetkind group of practices for many years and is nowadays principally found at Everton Hills Veterinary Surgery and Fernlands Veterinary Practice. Anita grew up in Switzerland but studied Veterinary Science at the University of Queensland in Brisbane. She now calls Brisbane home with her family and three cats. The cats Pandy, Fluffy and Gypsy are all rescue adoptions from her work. In her time away from work Anita regularly goes bushwalking, camping and enjoys the outdoors. Brisbane born and raised, Lauren graduated with honours from the University of Queensland in 2004. She enjoys all aspects of Veterinary Medicine, her particular interests being cardiology, diabetes, ultrasound and rehabilitation of injured and aged dogs. Lauren is accredited to assist with exporting pets overseas including health checks, vaccinations, bloods tests, and parasite treatments. Outside of work Lauren enjoys basketball, crossfit, running and hiking. She has a one legged peachface named Sparrow and an endlessly energetic Border Collie named Arthur. Michelle has over 20 years experience as a veterinarian. Michelle grew up in Brisbane and has worked around Brisbane and the UK. She has a special interest in pocket pets, such as guinea pigs and rats and backyard chooks, with membership in the Unusual Pet and Avian Veterinarians (UPAV) special interest group of the Australian Veterinary Association. She is club vet for the Northern Exposure Gig Racing Club, Queensland’s premier sled dog club, and a volunteer vet for the Iditarod Sled Race in Alaska. 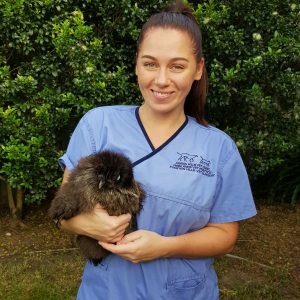 Katrina graduated from the University of Queensland and has worked in small animal clinics around Brisbane before joining the Vetkind team in 2016. 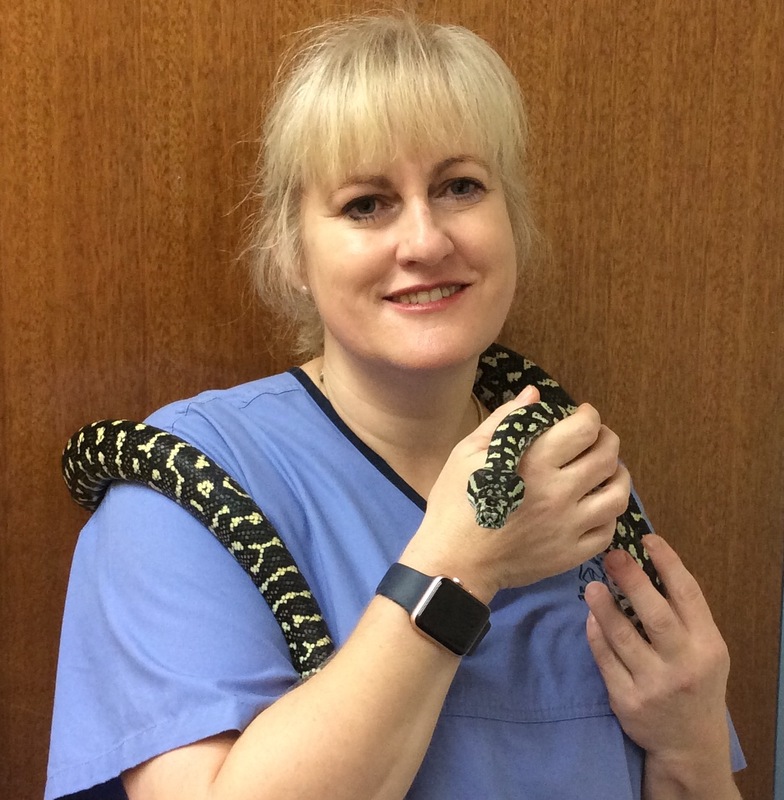 She works with us part-time and enjoys all aspects of small animal veterinary medicine. Katrina was born and raised in Zimbabwe, then moved to the UK to finish her schooling. She now calls Brisbane home with her adopted ginger cat, Scamp. Outside of work, Katrina enjoys floristry, camping, hiking and anything that involves spending times outdoors. Miv (Myfanwy) is our wonderful senior nurse. She is thorough, dedicated and empathetic, and not only a skilled nurse but also a key organiser in our clinics. Miv often brings her staffie, Tora, to work with her in storm season and has two 7 year old cats with special medical needs. Jennifer is one of our dedicated vet nurses. She commenced her employment with us while undertaking work experience and completing a Certificate III in Animal Studies. She has since completed her Certificate IV in Veterinary Nursing. Jenny is passionate about providing nursing care for our patients in hospital and surgical nursing. She also loves sharing stories and photos of our patients on our Facebook page. At home Jenny has an American Staffy fur baby named Ziva. Kirsty loves all animals including dogs, cats, reptiles, exotics and wildlife but has a passion for birds. Another special interest for Kirsty is enrichment and foraging for all animals to prevent boredom and help control body weight. She is owned by 11 parrots and a Red Cattle Dog X Greyhound. Nibbles the Quaker and Scribble the Green Cheek Conure rarely leave her shoulder at home. 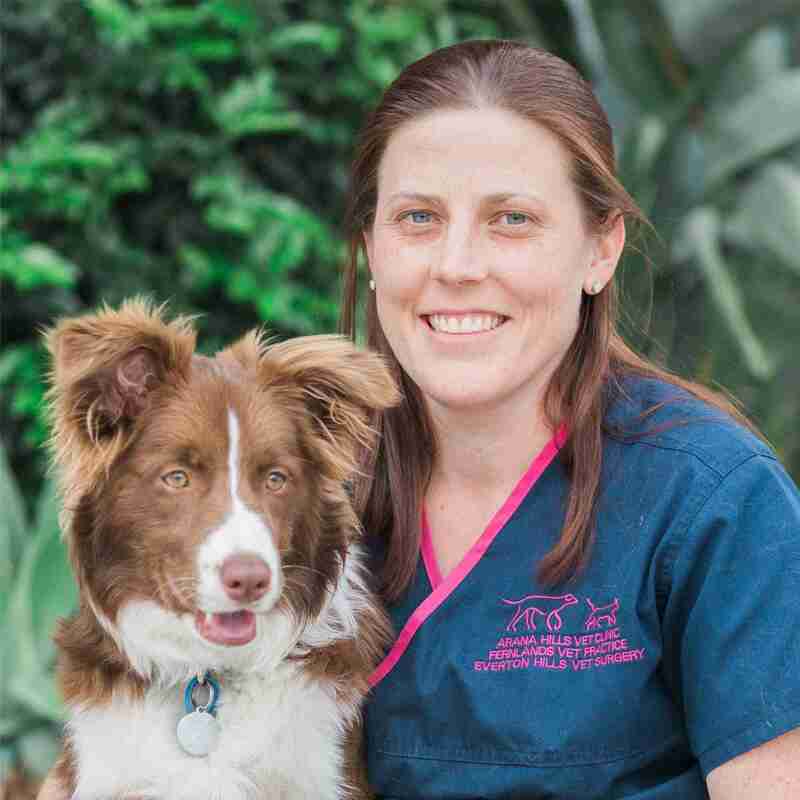 Kerri joined our team at the beginning of 2013 after working in small animal practices in Cairns and Maryborough. Kerri brings with her a love of nursing and she enjoys running our popular puppy preschool classes. She is the servant to her dog Scruff, as well as to her cats Pantera and Woof. Not only has Kerri rescued all these pets from different walks of life, but Pantera and Woof are especially lucky as they were both born with Feline Aids (FIV) and they have her to care for them! Leesa is a friendly face often found at reception at Arana Hills Veterinary Clinic. At home, Leesa has a dog, cat, guinea pigs and even a pet python. Leesa is also a regular volunteer nurse with AMRRIC, an organisation providing veterinary services to remote indigenous communities, and also volunteers with a dog animal welfare project on the Pacific Island of Kiribati. 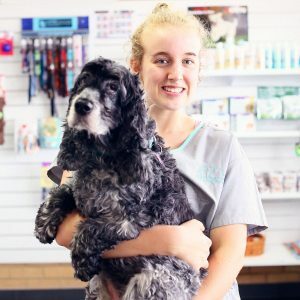 Eboni is a qualified and experienced groomer and undertakes grooming for your pampered pets at Arana Hills Veterinary Clinic. Eboni is also a qualified Veterinary Nurse, and is pictured above with her beloved Labrador, Bailey. She also has a Cavalier King Charles Spaniel called ‘Winchester’ and 9 chickens. Kelly is our Trainee Vet Nurse who has been with us since May 2017. With a keen interest in all aspects of nursing and animal care, Kelly will complete her Vet Nurse studies in June 2018. She is pictured here with one of her 4 dogs ‘Bella’ the Cocker Spaniel. She also has two labradors called ‘Shelby’ and ‘Harley’, and a Golden Retriever ‘Bonnie’. She also has Ragdoll cat called ‘Jinx’ to keep all those dogs in line. Ash (A.K.A. 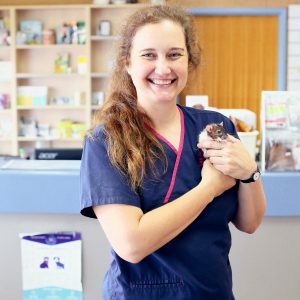 Nurse Ash 😄 – if you follow our social media) is a friendly face often found at our Fernlands Veterinary Practice. Ash is a qualified Vet Nurse, Groomer and runs our social media sites. (Facebook and Instagram). At home, Ash has two cats ‘Rodger and Marcus’, 4 x chickens (ISA brown, Silkie and Bantam Pekins),a Blonde Spotted Python pet snake ‘Sabre’ and a little pup called Cleo.